Global Voices is an international and multilingual community of bloggers, journalists, translators, academics, and human rights activists. Together, we leverage the power of the internet to build understanding across borders. How do we do this? Report: Our multilingual newsroom team reports on people whose voices and experiences are rarely seen in mainstream media. Translate: Our Lingua project volunteers translate our stories into dozens of languages to ensure that language is not a barrier to understanding. Defend: Our Advox team advocates for free speech online, paying special attention to legal, technical and physical threats to people using the internet to speak out in the public interest. Empower: Rising Voices provides training and mentorship to local underrepresented communities who want to tell their own stories using participatory media tools. Global Voices typically has one or two active special projects at a time. Special projects in 2018 include our NewsFrames collaborative media analysis project and our ongoing Translation Services project, which offers translation work to like-minded organizations for a fee. Volunteer contributors are the engine that makes Global Voices run. In addition to writing and translating stories, contributors provide a breadth of local knowledge and connect Global Voices with like-minded initiatives around the world. Meet our contributors. Media and NGO partnerships are also a key component of Global Voices’ work as a community, a media organization, and a network of free expression advocates. Learn about our partnerships. 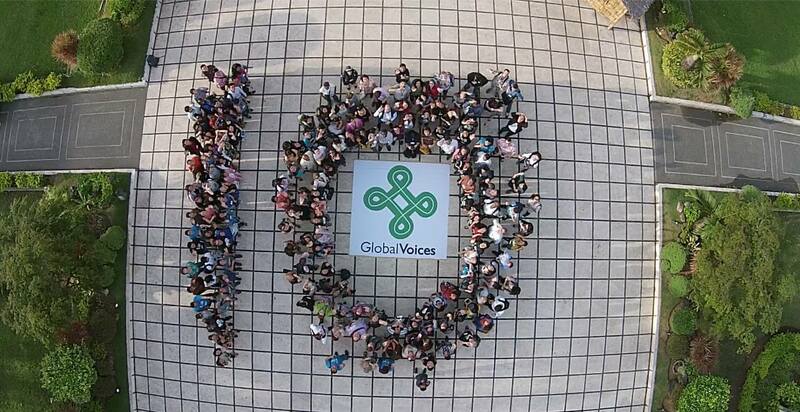 Global Voices is driven by a diverse management, editorial and administrative team. Contractors and staff operate under applicable labor laws. Meet our leadership team. Global Voices is governed by a board of directors, whose members include our founders, volunteers, and staff, along with some of the most influential innovators in global online media. Board members serve without remuneration. Meet the board. Learn more about the details of our work and staff structure in our Roles and Responsibilities page of the Global Voices Community Guide. Global Voices is incorporated in the Netherlands as Stichting Global Voices, a nonprofit foundation. We rely on independent grants, editorial commissions, and corporate and individual donations. Read more about our work and financial structure in our annual reports. Want more details? Read our FAQs.